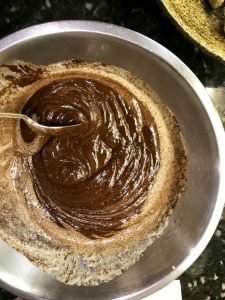 I’ve had a bit of a hit and miss time when making brownies. 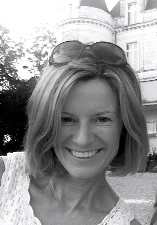 Some of the recipes I’ve used are guaranteed to deliver really luscious, gooey chocolate brownies (Delia Smith chocolate nut brownies BBC Food – Recipes – Four nut chocolate brownies are great and even better when you double the amount of chocolate). Other recipes I have found to be rather dry and cake like. This might be due to the slight over baking/too hot an oven on my part, (even cook’s can make a mistake!) Or it could just a rubbish recipe, where the chocolate: sugar : butter ratio is just wrong. 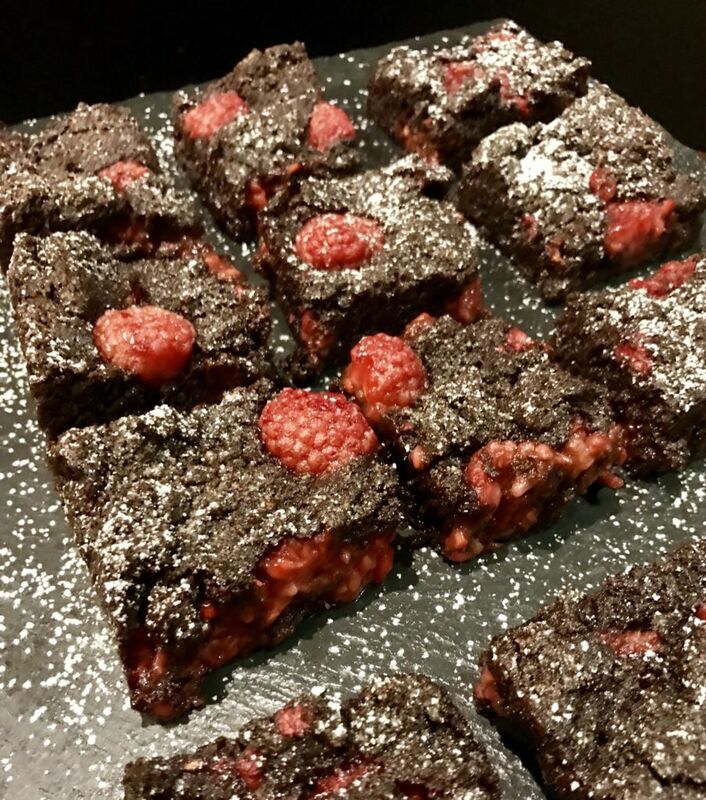 I came across this recipe for chocolate and raspberry brownies from Winola at the foodscape. (Raspberry Brownies ) and they really are delicious. As my niece is now celiac but still loves baking I thought it would be a good idea to try and come up with something similar but gluten free and I must say the end result is really good. 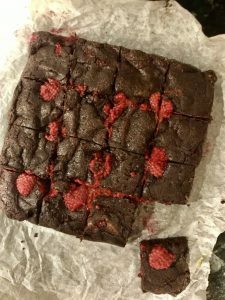 Also they contain much less sugar than many brownie recipes but still have that lovely gooey texture. Line a 20x 20cm loose bottomed cake tin with baking parchment. Place the chocolate and butter in a bowl over simmering water and leave till melted. Crack the 3 eggs into a bowl and blitz for 10 seconds with a hand blender ( or whisk by hand till light and frothy). Pour into the melted butter and chocolate and lightly stir (taking care not to split the mixture). Sieve the flour and cocoa into the chocolate mixture and fold together. 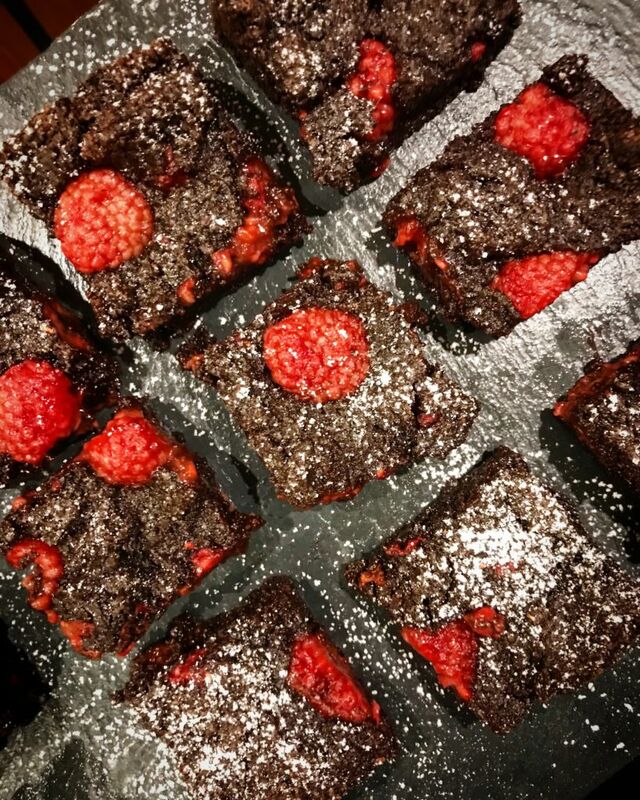 Reserve 10-12 raspberries and fold the rest into the brownie mixture. Pour the brownie batter into the tin and scatter the remaining raspberries over the top. Sprinkle over a generous pinch of salt. Reduce the oven temperature to 160C and place the brownies in the centre of the oven to cook. Bake for 16-19 mins until a crust has just formed over the top of the brownies but the centre is still a little gooey when a skewer is inserted. Remove from the oven and leave to cool for 5 minutes before cutting them into 16 squares. These are delicious served still warm on their own, or with a scoop of vanilla ice cream. They will keep for a couple of days in an airtight container if you can resist them that long!